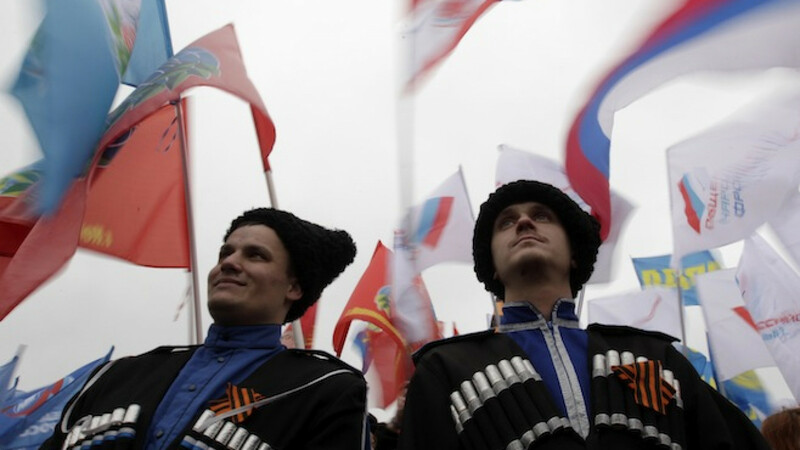 Russian Cossacks attend a rally marking the first anniversary of the Crimean treaty signing in Stavropol, southern Russia, March 18, 2015. THE HAGUE — Ukraine wants the International Criminal Court to investigate all alleged recent war crimes in Crimea and eastern Ukraine, Foreign Minister Pavlo Klimkin said in an interview, broadening an existing probe. Ukraine has already given the global court the authority to investigate crimes on its territory from Nov. 21, 2013, to Feb. 22, 2014 — the period leading up to the fall of Ukraine's former president Viktor Yanukovych. Russia annexed Crimea soon after, and later in 2014 fighting erupted in eastern Ukraine between Kiev's forces and pro-Russian separatists. Kiev accuses Russia of sending arms and troops to aid the rebels, which Moscow denies. An ICC referral would cover "everything under the [ICC] mandate, including crimes against humanity," he said. Klimkin named the attack on the strategic port of Mariupol in eastern Ukraine which killed 30 in January as an example of a crime against humanity. "The shelling killed, in seconds, more than 30 people and heavily wounded 100 people," Klimkin said. "If you deliberately shell and, I stress, deliberately shell cities, killing civilians, it's a completely different situation [from military operations] and we have to engage the ICC." The wider probe proposed by Klimkin would for the first time consider allegations of direct Russian involvement. Ukraine is also examining the possibility of launching a case against Russia at another court in The Hague, the International Court of Justice, the highest UN court for territorial disputes, Klimkin said. There was no immediate reaction from Russian authorities to Klimkin's comments. ICC prosecutors began their preliminary inquiry last April after the government of Ukraine asked them to look into allegations that Yanukovych's troops had killed more than 100 protesters in Kiev and other cities. The referral period runs up to just before Russia annexed Crimea, so the investigation so far excludes any crimes that might have been committed by Russian-backed troops. Alex Whiting, a former senior ICC prosecutor, said a new referral could force an ICC investigation of the wider Ukraine conflict. "The prosecutors have been kind of sitting on it because it's more complicated whether there have been war crimes," he said. "But here [Crimea and eastern Ukraine] there have been widespread allegations of war crimes and even crimes against humanity, so it will be much harder to ignore." Klimkin said that an amnesty granted to suspects in the conflict by the Minsk cease-fire agreement would not apply to crimes that fell under the ICC's statute.